There are some who love yellow and some who don’t. But whether you do or don’t, it is a cheery colour and some say it instils confidence… increased self-esteem, friendliness and even creativity - that is, unless there is too much of it, and then it can elicit some other emotions like irrationality or anxiety. Many years ago, I read a quote by Alexandra Stoddard, a leading expert on design, in her book “Creating a Beautiful Home”. Maybe that could mean garden rooms too. Long ago, my kitchen was cobalt blue and white - so a touch of yellow, made those colours pop. Not so much in my living room that was mostly shades of pink or rose with some green. 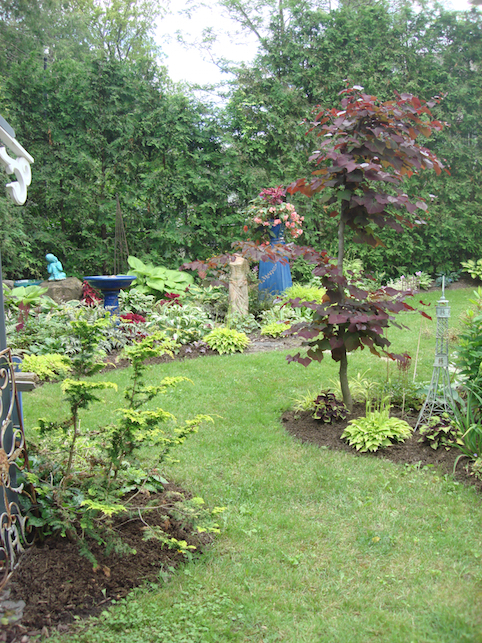 In the garden, we rely on a canvas of greens to show off the other colours we choose. Green creates a balance… it is restful and some say even peaceful… I find it refreshing, but then again, too much of it, like anything else, can be tedious. And “green” is essential to life… green leaves, vegetables, herbs and grass. It shows us there is water - and water equates to life. I never wanted yellow in my garden. I’m one of those who likes a peaceful, restful palette of blues, mauve, pinks and purple. But one day, I fell in love with a pot of Japanese Forest Grass (Hakonechloa macra) and it was a yellow green… very yellow, in fact. 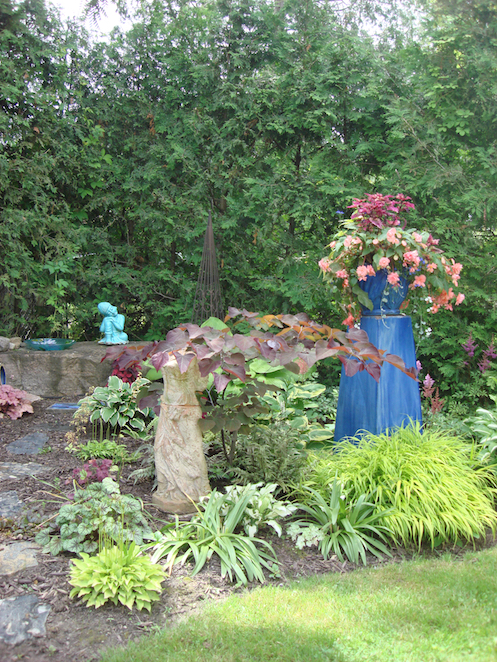 I planted it against a tall deep blue pillar and the effect was stunning. 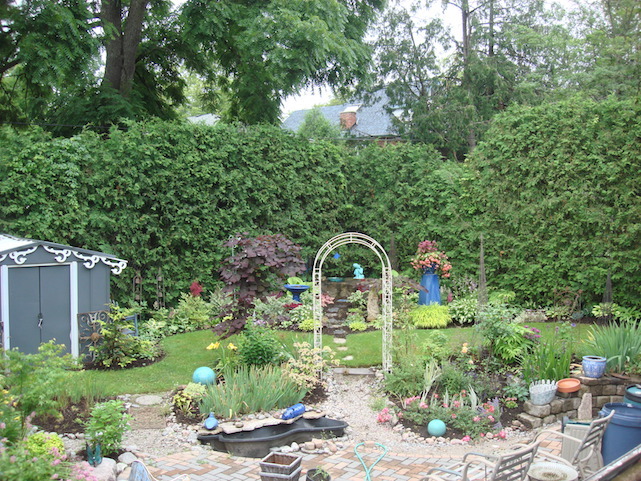 I couldn’t keep my eyes from going there, to the point that it’s where I looked immediately when viewing my own garden. Alas, my eyes quickly swept past the lovely blues, pinks and mauves and whether I wanted to or not, they rested immediately on that yellow grass. So I gave in and added a bit more yellow-green in other places- just to see if my eye would follow it from one bed to another - a bit like having a thread that pulled my eye along a line: with shades of yellow or yellow-green, I was able to purposefully lead any viewers eye where I wanted it to go. 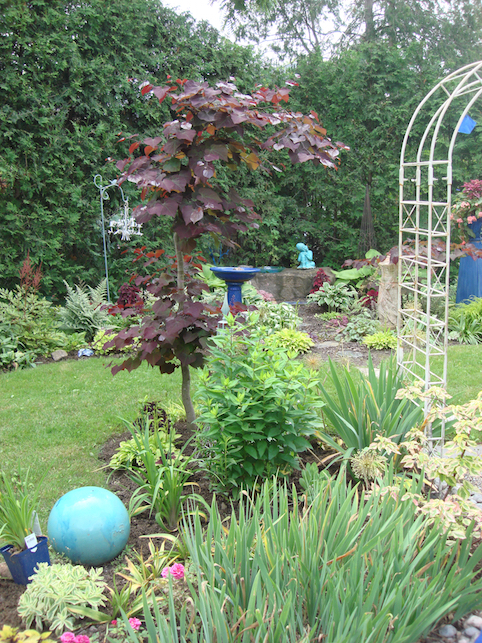 Variegated Phlox (yellow and green foliage), a yellow and green Pagoda Dogwood, a chartreuse Barberry, a yellow Daylily and a Hosta whose green leaves sported a saucy yellow edge. It was delightful and surprising. I was pretty pleased with myself. So imagine my surprise when I read these words, written by Christopher Lloyd, gardener extraordinaire in Britain, in his book “Other People’s Gardens”. He was writing about his visit to Chilcombe, a garden close to the English Channel. “I wouldn’t give space to either myself”, he mused… and then he noticed a small “bright little yellow flower” and asked his host John, how he “ felt about this colour (yellow) as “so many gardeners of good taste dislike it”. John just shrugged and said, ”we like it”. Try it - carefully, though… vary the shades of yellow… from cream to yellow roses, from soft yellow of some daylilies, to the bring yellow of Brown-eyed Susans. Then a soft yellow green to a sharp chartreuse…. 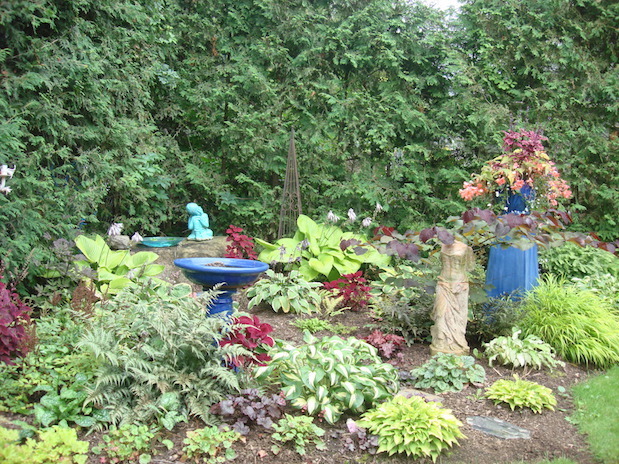 but add just a bit at a time, or you will end up with a yellow garden and too much of anything is never a good thing. See how your eye travels from one spot of "yellow" to another and winds its way through the garden?